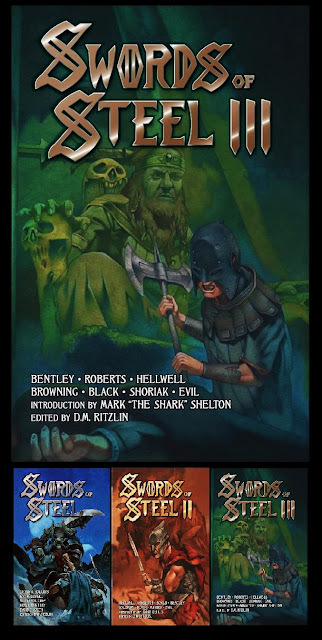 Byron Roberts (Bal-Sagoth): "SWORDS OF STEEL III" available now! "SWORDS OF STEEL III" available now! SWORDS OF STEEL III is available now from DMR Books. The third volume in the acclaimed Swords of Steel paperback anthology series features my story "The Scion at the Gate of Eternity", bringing the epic Caleb Blackthorne trilogy to a conclusion. All three volumes in the SWORDS OF STEEL series can be ordered directly from the DMR Books store HERE.